I’d say, too, that Philly’s got a secondary binary at work in its sandwich society. There are the gutbusters (Italian hoagie, anyone?) and the lighter side. I’m not saying that a banh mi is diet food by any stretch, but you can probably bite into one without dislocating your jaw, unlike most Philly-style sandwiches. Now, not to push this metaphor into preciousness, but as anyone who’s taken a gender studies class in the last 20 years knows, binaries are ripe for deconstruction. Queer has been an operative term in this regard. According to David Halperin (via Wikipedia), “‘Queer’ then, demarcates not a positivity but a positionality vis-à-vis the normative,” meaning that it defines itself through and against what’s considered normal, which are, at heart, those binary terms. 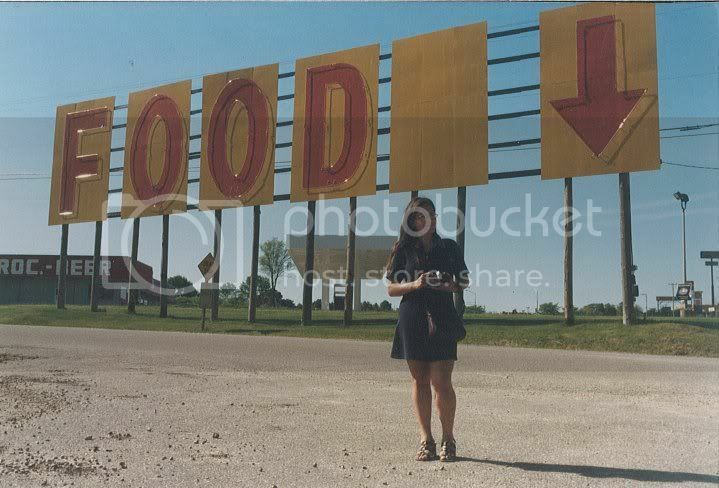 This is where cheesesteaks come in. 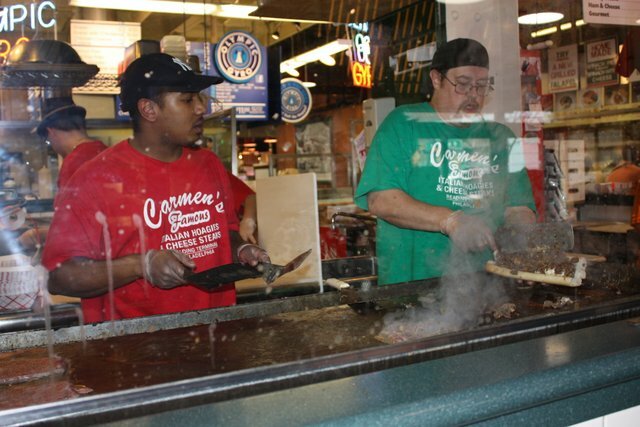 A recent trip to Reading Terminal Market took my companion and me to Carmen’s Famous Italian Hoagies, which specializes in cheesesteaks. 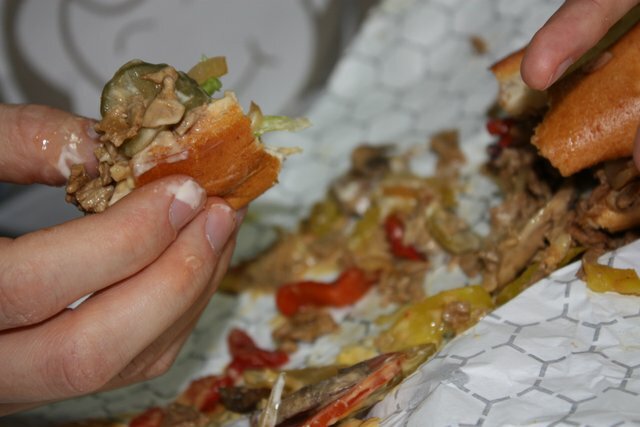 I don’t have to tell you what a cheesesteak is–thinly sliced beef, fried, on a long roll, with cheese (either Cheez-Whiz or provolone), maybe some fried onions or peppers–or where it falls on the Philly sandwich binary. 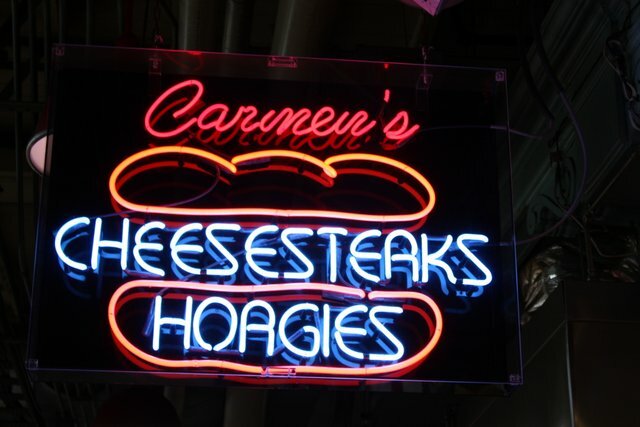 But if that combination counts as the norm, than Carmen’s, like many places in Philly, is queering the cheesesteak too, with a vegetarian version made with seitan, vegan if you forego the cheese (but let’s not get crazy here, people! To quote George Costanza, “we’re living in a society.”). And what better way to understand positionality vis-a-vis than with a taste test? On one side, the regular cheesesteak, with Whiz and onions, on the other, the vegetarian version, with Whiz, onions, mushrooms, peppers, and everything else that the man at the counter asked if my companion wanted before he realized that each addition was $.50 more on my tab. The meat version of a seitan cheesesteak. They both looked good, and, honestly, meaty. My normative cheesesteak was moist and juicy, and while the bread could have been a bit crisper, this steak beat all the others I’ve had, and won bonus points for not making my hands smell of onions for the rest of the afternoon. The seitan version of a meat cheesesteak. Comparatively, the vegetarian version was a good substitute, but the seitan just didn’t have the seasoning to give it the heft needed to be the star of a sandwich. My companion loved it, though, placing it nearly at the top of the vegetarian cheesesteak pyramid in Philadelphia (I’d give that honor to the offering at the American Sardine Bar). 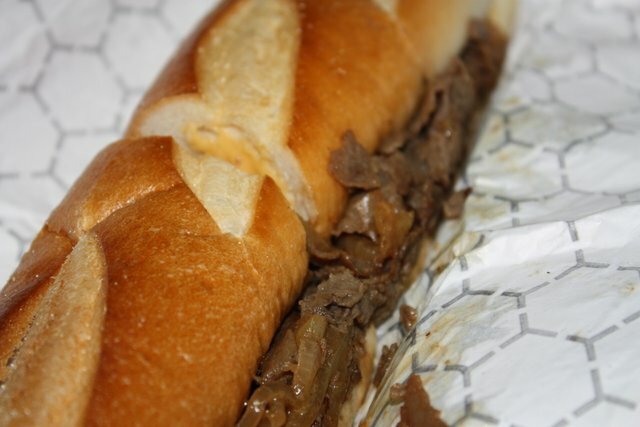 With its layers of flavor-boosting additions, it was a satisfying meal, that often exploded out of its bread, while my daintier cheesesteak stayed contained. I do have one quibble, though not with Carmen’s. As more and more restaurants offer vegan options, it seems like fewer and fewer actually include vegetables in them. In recent months, I’ve seen seitan cheesesteaks, pulled “pork” bbq tofu, and meatless buffalo wings in addition to the more expected veggie burgers and hot dogs. Not to draw too many parallels, but if vegetarianism has been one method of bodily critique of the excesses and structures of our contemporary society (from factory farming to fast food), than is it wise strategy to make a vegetarianism based on seitan and tofu a new norm? Do we want vegetarianism to mirror the protein-based diet of mainstream America, which is really what is happening here? Sure, more people will feel comfortable with vegetarian food that looks like what they’re used to, but shouldn’t part of the point be to stretch people’s minds while also stretching their culinary habits? Something to chew on. 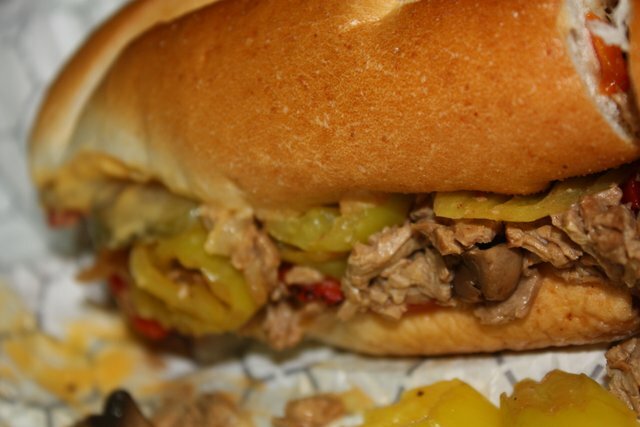 Recommended: cheesesteaks, people, haven’t you been paying attention? This entry was posted in food, Philadelphia, Uncategorized and tagged cheesesteak, Philadelphia, queer, Reading Terminal Market, vegan, vegetarian. Bookmark the permalink.